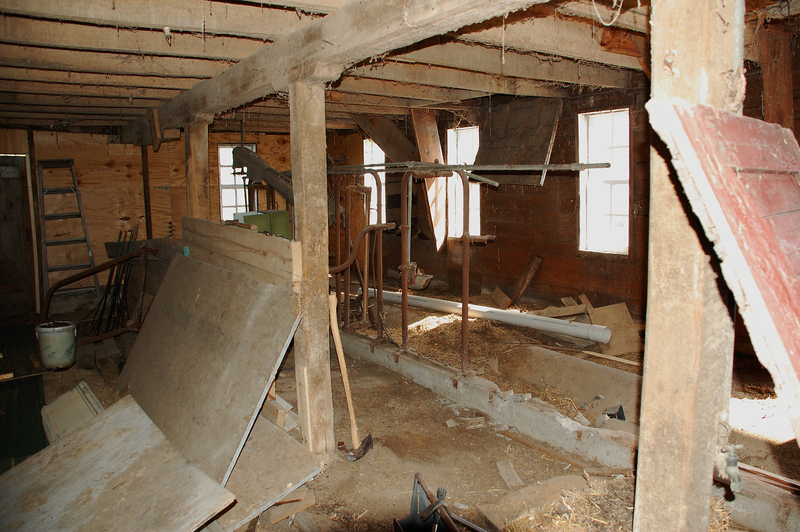 Along with all the miscellaneous lumber and junk, the old cattle stanchions stand in the rear of the barn from the days when it was a functioning dairy barn. Because the pipes were all rusted together, the only way to remove them was with brute force. Jesse is out of town for work for two weeks, so our oldest son took on the task and busted the concrete out that held the stanchions with a sledgehammer. It was a messy job with dust and concrete chips flying everywhere. He decided, on his own, to wear safety glasses to protect his eyes. I was impressed. Once he would get the concrete broken, he would pull on the stanchions to break it out from the base. He removed one side of the stanchions on Saturday and the other on Sunday. 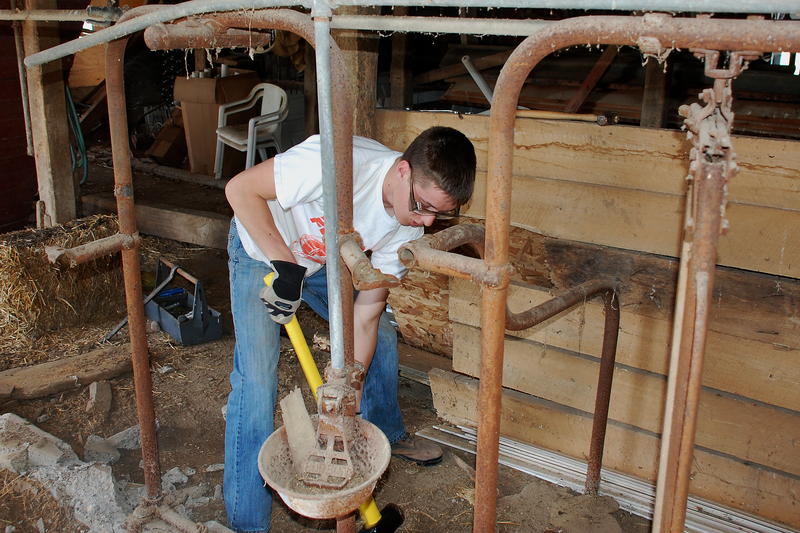 On Sunday, when it was time for him to work on the stanchions on the north side, we realized that we needed to move some lumber out of his way from the old house. 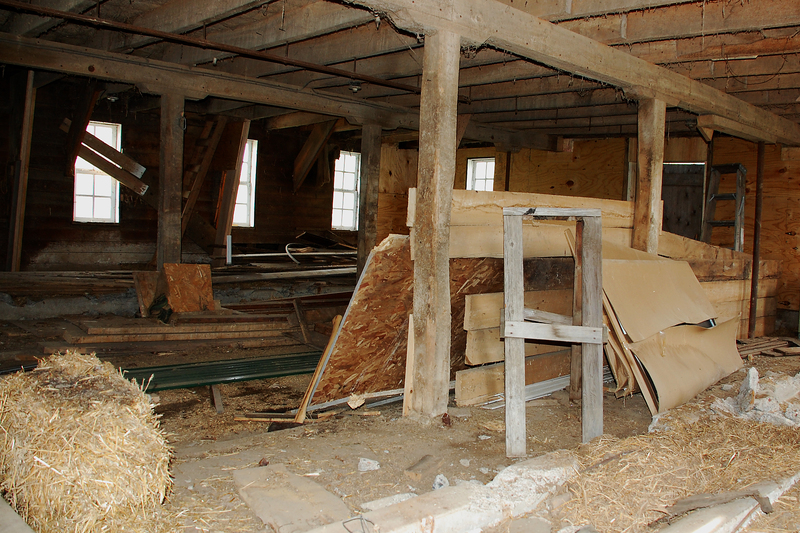 The kitchen and dining area of the original farm-house had wains-coating that we salvaged before tearing it down. It has been stacked in the barn for a decade. 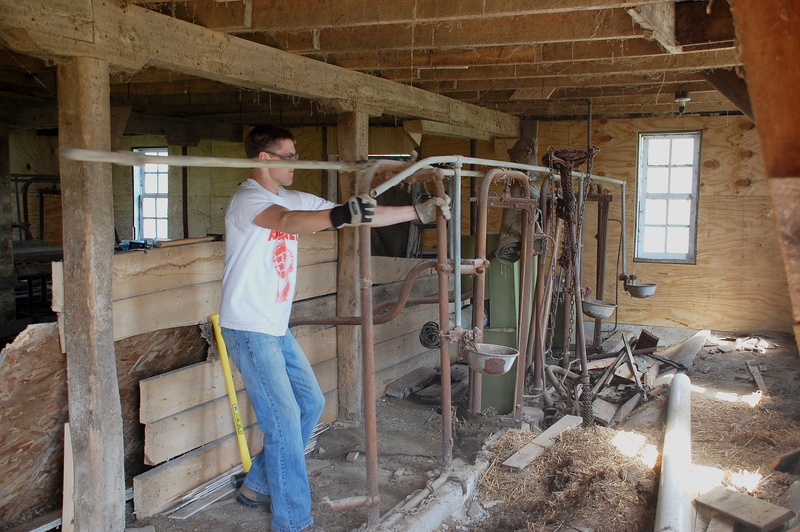 We decided to put it up into the hayloft to get it out-of-the-way. Now, it is pretty obvious that this is a kind of creepy building inside, at least for those of us that are a little afraid of spiders, bats, mice, etc. As I was standing on the ladder surveying the loft area, I heard the distinct sound of a bat squeaking. I let out a little scream and quickly climbed down and asked the kids if they had heard it. My son climbed up the ladder, looked around, and assured me that the bats were on the far end of the loft and would not bother me. All the recent activity in the barn had obviously stirred them up. Being the good mother that I am, I told my daughter that she would have to go up in the loft and I would hand the boards to her for stacking. I explained to her that I would get both of us hats to avoid any possibility of the old wives’ tale about bats getting caught in a woman’s hair coming to fruition. I’m not sure, but I think she felt reassured. My son then chimed in with some commentary about how ridiculous we were being and that no bats were going to come near us. Perhaps from the pressure of her older brother, or maybe out of sheer pity for her frightened mother, my lovely daughter agreed to be “the bigger person” and go up into the loft and stack the boards. But first, she donned a serious mask to save her lungs from all the dust. We worked quickly, trying to ignore the squeaking bats, until we had moved all the boards out-of-the-way for the stanchion removal. What a relief! 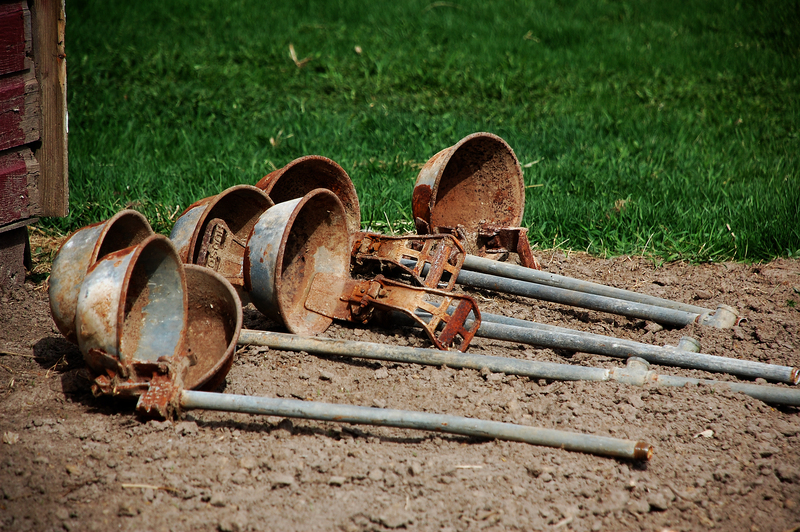 As our son was working on removing the stanchions, these drinking bowls for the cows caught my eye. I decided that I wanted to save them for some type of recycled use in the barn or granary. Maybe mounted on the wall as a container to hold gardening tools, or seeds? I’m not sure yet, but I made him remove those that he could separate from the rusted metal. 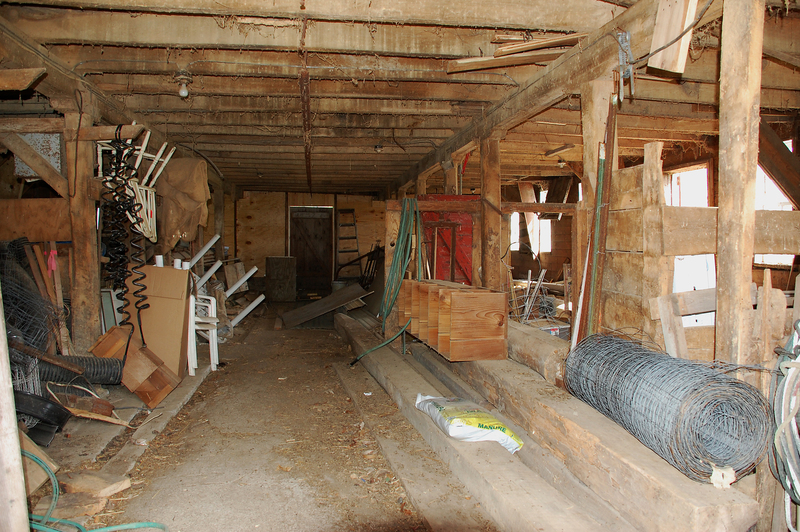 At the end of the weekend, the barn looked like this inside. Still a complete disaster, but looking a little more open without all the stanchions and pipes. 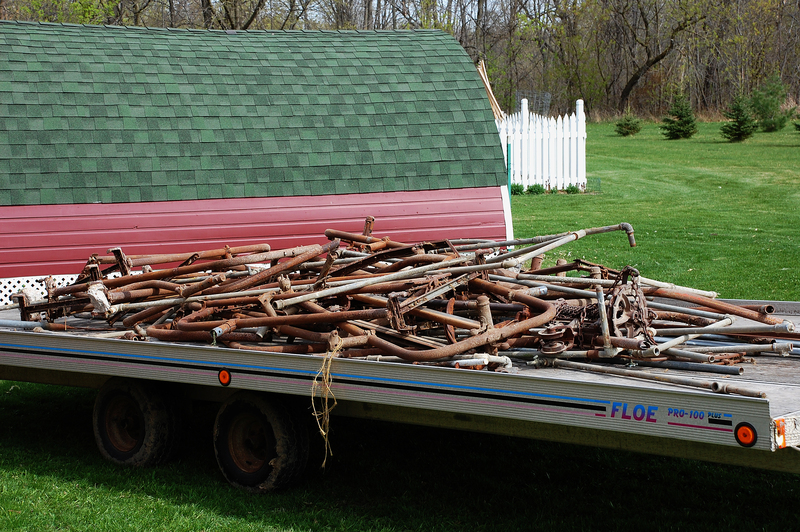 We will haul them to the township on Saturday and cross our fingers that they qualify as “scrap metal.” If not, we will have to figure out an alternative disposal plan. 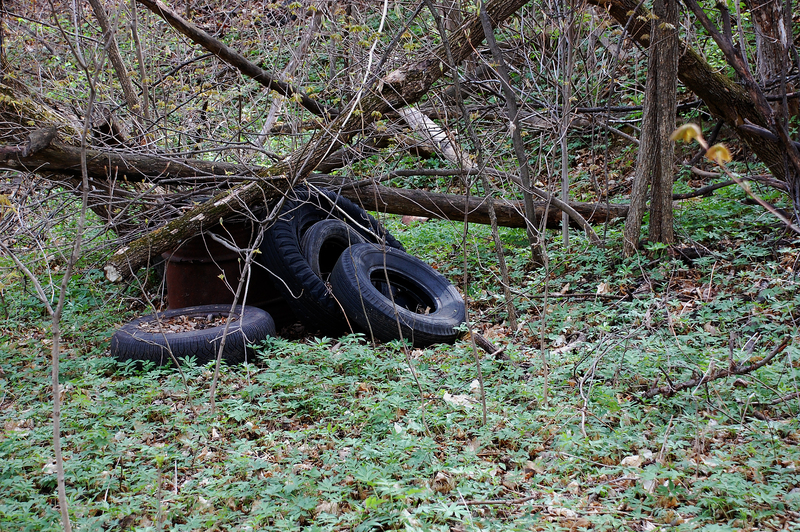 Along with our scrap metal, we will also be bringing in our limit of old tires (4). The practice on the working farm was apparently to throw everything that would not burn over the river bank behind the barn. We have been picking things up bottles, cans, old pans, tires, etc., since we bought the property. While we have definitely made some progress, I think it will be a never-ending process. 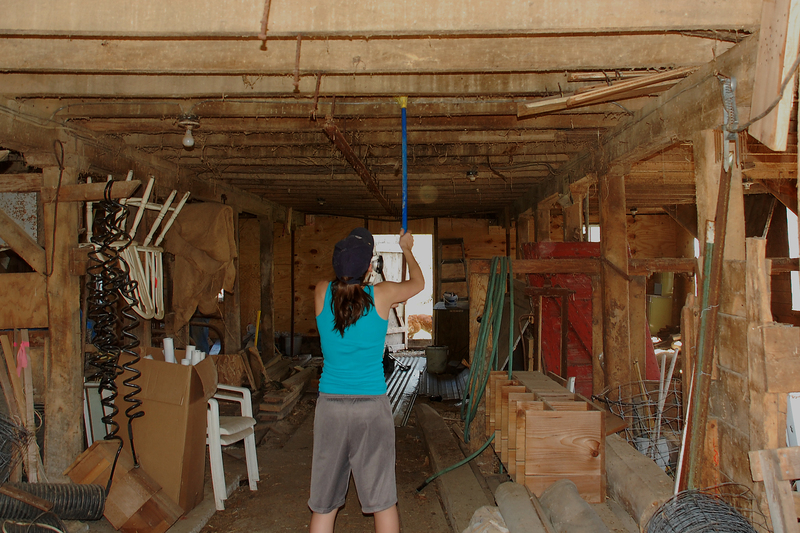 Inspired by the progress we made on the barn over the weekend, my sweet daughter decided to get a broom and start sweeping down the cobwebs from the ceiling. I love having strong, young and brave teenagers for exactly these kinds of projects! Love all the pictures! Thanks for sharing!